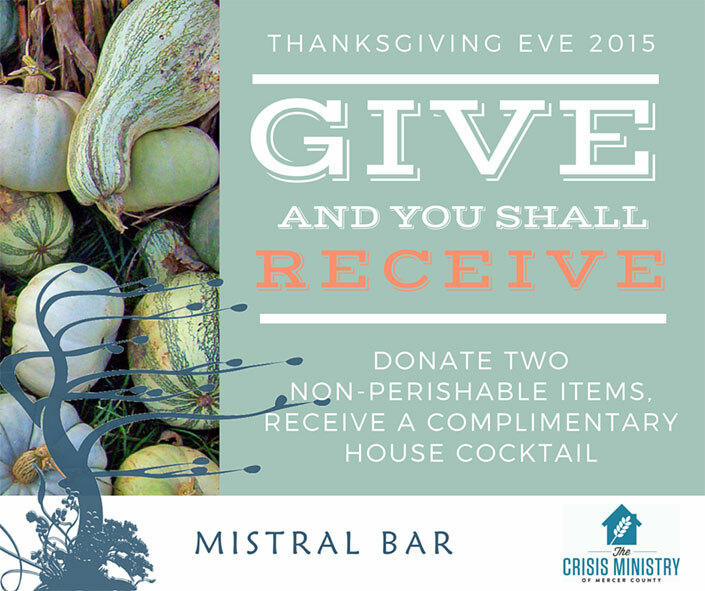 Come together at Mistral Bar this Wednesday, November 23 to give thanks and cheers with friends. We are proud to support The Crisis Ministry of Mercer County, whose mission is to provide low-income families with services needed, including hunger prevention. This Thanksgiving Eve, we invite our guests to join us in our support by donating non-perishable food items such as canned low-fructose fruits and vegetables, dried beans, rice, cereal, etc. to the Crisis Ministry. As an expression of our gratitude, all guests who donate two non-perishable food items will receive a complimentary house cocktail.